DETAILS: Spend your next vacation at this fabulous, gulf front condo tucked away in serene Blue Mountain Beach off of Scenic 30A. This 2200 square foot condo offers four bedrooms, three bathrooms and impeccable accommodations for up to ten guests making it the perfect spot for a family getaway. Entertaining will be a breeze as this condo offers an open floor plan that includes a fully equipped kitchen, dining area and living room that leads out to the gulf front patio. Adagio's community amenities offer endless days of fun in the sun as the private beach access, gulf front, infinity edge pool and three-tiered pool at the center of the complex are all just moments from your front door. When you're ready to explore the surrounding 30A area, be sure sure to check out the premium shopping and dining venues in neighboring Grayton Beach, WaterColor and Seaside. This adagio unit comes with two parking spaces. Check availability and book with 360 Blue today! We love staying at the Adagio on 30a! 360 blue was wonderful to work with. We traveled from 15 hours away and got to the property earlier than expected. The renter graciously allowed us in a few hours early, which we very much appreciated after our long travel. We rented a ground property which was perfect for our large group. We were steps away from the stairs to the beach and had a nice lawn area to spread out and enjoy the sunny outdoors. Since we vacationed during Thanksgiving, the kitchen offered all the amenities we needed to prepare a meal. A few of the appliances needed updating in that our dishwasher was out of service and the washer / dryer did not work well. Opening the sliding glass doors and enjoying the ocean view, along with indoor-outdoor living space was amazing. The beach was breathtaking. We rented paddle boards and bikes to add a little adventure to our trip. We are so thrilled that you enjoyed your stay with us in Blue Mountain Beach at Adagio! We agree that this condo is a perfect option for families to come together to enjoy a fun and relaxing holiday! This condos location is wonderful and makes for a very easy getaway! Thank you for sharing such a beautiful family photo and thank you for staying with 360 Blue, we hope to see you all again soon! We had a fabulous time at Adagio for fall break. C-102 was perfect - right on the beach, kids could run and play int he yard and the pool also just steps away. The condo was very well stocked with all the kitchen essentials which was perfect as we like to cook the local seafood. :-) We will book at Adagio again in the future for sure. We are so thrilled that you enjoyed your stay with us in Blue Mountain Beach! 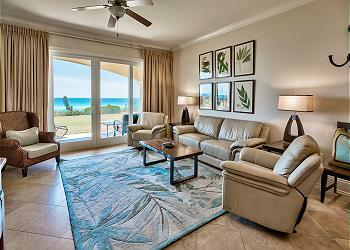 We agree that this condo is perfect for a fun and relaxing beach getaway! We look forward to seeing you all again soon! We’ve had an absolute blast. Unit is perfect and convenient to everything. The refrigerator and dryer need to be updated. The WiFi is also sub-par. We are so glad that you all had a good time with us in Blue Mountain Beach! We do apologize for the Wifi and appliances being less than perfect and we will be sure to share this feedback with our entire team in an effort to correct this for future guests. We hope to see you again soon! This is our third time staying at this beautiful facility. Have a house full of little beach and pool lovers the first floor always makes for a great time. I can't wait to stay again for Labor Day 2018! What a precious photo! It's definitely one to frame and look back on for years to come! We are delighted to hear that you enjoyed your third trip with us! We love becoming a part of wonderful traditions like this! Thank you so much for choosing 360 Blue again, and for sharing your experience with us. We look forward to helping you plan Labor Day 2018! What a beautiful family photo! We do apologize about the cleaning issues, but we are happy that it did get resolved as well as the dishwasher issue during your stay! 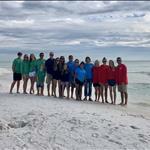 Thank you so much for staying with 360 Blue and we hope to have you back on 30A again soon! 9 of us came for spring break. It was beautiful. The condo was more than I expected very big and beautiful. The location is great and the kids enjoyed the pools, bikes and ice cream as well as the beautiful beach. We are so thrilled you and your family had such a wonderful time at Adagio! It's so nice that you and the kids enjoyed the beaches and pools and especially the ice cream shop that is so close by! Thank you so much for staying with 360 Blue and be sure to come back soon! We loved the unit. Close to beach, close to pool and the grandkids loved the grassy area to play. Best condo we've ever stayed in. Great for large families. We will be back. We are so happy that you loved this condo as much as we do! It really has everything a family needs for an amazing beach getaway. We hope to have you all back soon! Amazing!! We have been coming to destin with our families for 25 years. We decided to shift a little east this year to Santa Rosa, per suggestion from a fabulous 360 blue agent, and we are hooked! We shared 2 condos at adagio for 19 people and it was absolutely perfect. We loved biking to seaside,running along 30a, paddleboarding, swimming at the pools, and just relaxing on our patio and at the beach. The condo was beautiful! The beach was a little crowded as it is narrower here than in destin, and a lot of people share the space, but the crowd was friendly and wonderful so no issues at all really! Hi Metzner Family: We are so glad to hear that you enjoyed your vacation. Thank you for staying 360 Blue and we hope to see you at the beach in the near future!